In this video we will discuss Event Binding in Angular with examples. The following bindings that we have discussed so far in this video series flow data in one direction i.e from a component class property to an HTML element property. How about flowing data in the opposite direction i.e from an HTML element to a component. When a user performs any action like clicking on a button, hovering over an element, selecting from a dropdownlist, typing in a textbox etc, then the corresponding event for that action is raised. We need to know when user performs these actions. We can use angular event binding to get notified when these events occur. For example the following is the syntax for binding to the click event of a button. Within parentheses on the left of the equal sign we have the target event, (click) in this case and on the right we have the template statement. In this case the onClick() method of the component class is called when the click event occurs. 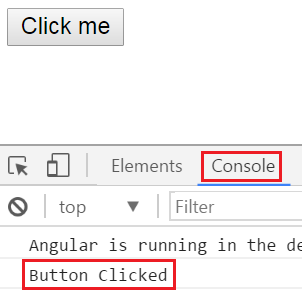 Every time we click the button, 'Button Clicked' message is logged to the console. You can see this message under the Console tab, in the browser developer tools. 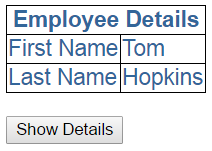 Another Example : Initially when the page loads we want to display only the First Name and Last of Employee. We also want to display "Show Details" button. When we click "Show Details" button, we want to display "Gender" and "Age" as well. The text on the button should be changed to "Hide Details". When we click "Hide Details" button, "Gender" and "Age" should be hidden and the button text should be changed to "Show Details". To achieve this we will make use of event binding in Angular. We will also make use of one of the structural directives "ngIf" in angular. 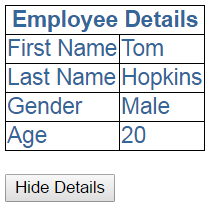 Code in employee.component.ts : Notice we have introduced "showDetails" boolean property. The default value is false, so when the page first loads, we will have "Gender" and "Age" hidden. We also have a method, toggleDetails(), which toggles the value of showDetails. When save the application at that time changes aren't reflating on browser..
which browser are you using? all browser consoles have an option of "clear cache" or always refresh from the server, but these only work when you have the developer tools opened on the window. Something like this is always related to old browser cache being used for display. Tons of thanks for all your tutorials. Nice! if the above code won't work add the CommonModule on your AppModule. Why we use use * in front of "*ngIf"